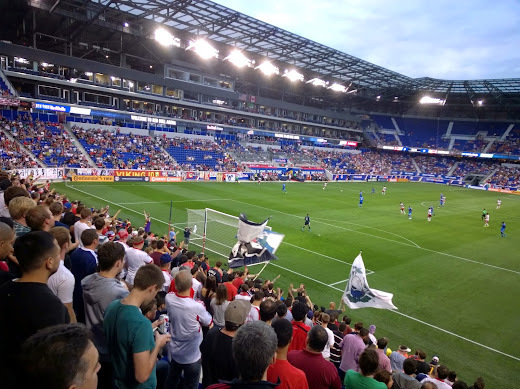 It was Fortress RBA again as the New York Red Bulls posted a comeback victory to sink the bottom of the East Montreal Impact even deeper into MLS oblivion. The Henry/BWP strike partnership continues to bear fruit as "Le Roi" scored as lovely a brace as you've ever seen him score. The other half of that partnership, "The Guv'nor" Bradley Wright-Phillips, continued his epic, League Leading goal scoring form, with a brace of his own. He's now shattered the all-time MetroBulls record (previously held by RBNY Legend Juan Pablo Angel) with his 20th goal this season. Clearly inspired by TH14, long may the "BWP Effect" continue. No respite for the Red Bulls, as they are back in action tonight, in Concacaf Champions League action. Ryan Meara will be in goal and new man Saer Sene, who made his RBNY debut as a late sub for TH14, should make his starting debut. One thing is for sure, a win is an absolute must tonight if RBNY has any serious aspirations to get past the first CCL round. Check out the above video for the usual drunken comments/predictions. Please click here for Matt Kremkau's photos form this one (slide show here). Hope to see you all tonight @The Cathedral of Football, Red Bull Arena (built by Makita). Git in RBNY!! !